MORRISON, Colo. – The two winningest drivers in their respective classes in NHRA history, John Force and Tony Schumacher, scored historic victories Sunday at the Mopar Mile-High NHRA Nationals at Bandimere Speedway near Denver. Allen Johnson (Pro Stock) and Andrew Hines (Pro Stock Motorcycle) also were winners at the first NHRA Mello Yello Drag Racing Series finals in history to be televised live on a national broadcast network. 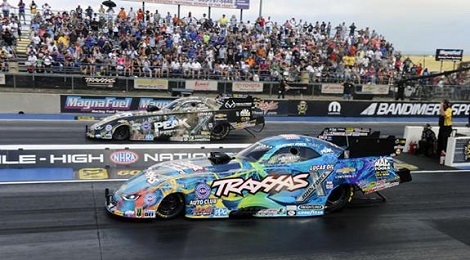 It was the first win of the season for both legendary drivers, who have earned the most world championships and victories in Funny Car and Top Fuel, respectively. They gave epic performances to the national television audience watching the finals live on FOX. Force defeated his daughter Courtney in a close Funny Car final. In a battle between Chevy Camaros, he finished in 3.965 seconds at 319.45 mph in his Realtree Peak Antifreeze Camaro to her performance of 3.963 at 314.75 in her Traxxas Camaro. It was the elder Force’s first win of the season, seventh at Denver and 144th of his career. Force hadn’t won a race since June 2015 in Epping, N.H.
“I didn’t have a monkey on my back, it was a gorilla,” said Force, the 16-time world champ who at age 67 becomes the oldest driver in NHRA history to win a Funny Car race. Force, who also made history earlier in the weekend by clocking the first three-second Funny Car run ever at Bandimere Speedway, outran Jeff Diehl, Matt Hagan and defending world champ Del Worsham to advance to the final. In the final against his daughter he said he needed to totally forget who was in the opposite lane. Schumacher, an eight-time world champ, also busted out of a lengthy winless streak and claimed his first win of the season, third at Denver and 82nd of his career. He outran the defending world champ, Antron Brown, in the final round with a run of 3.802 at 324.28 in the U.S. Army dragster. Brown’s Matco Tools dragster slowed near mid-track and finished in 5.199 at 144.75. Schumacher, who climbed to fifth in the points order with the victory, hadn’t won since July 2015 in Chicago. With the runner-up finish, his sixth final round of the season, Brown maintained the points lead, 57 over second place Kalitta.